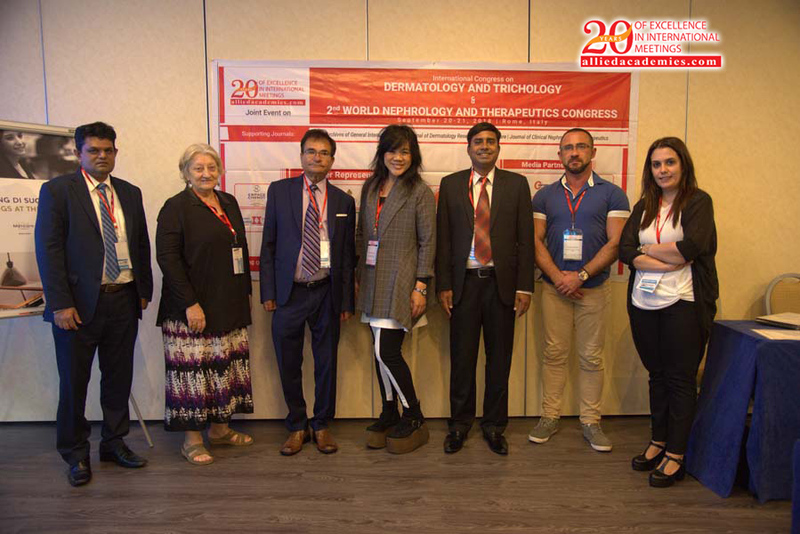 The 2nd World Nephrology and Therapeutics Congress were organized on September 20-21, 2018 at the Hotel Mercury Roma West Viale Eroi di Cefalonia, 301, 00128 Roma RM, Italy. The conference was marked with the attendance of Editorial Board Members of supported Allied Academies Journals, Scientists, young and brilliant researchers and talented student communities representing more than 10 countries, who made this conference fruitful and productive. World Nephrology 2018 was moderated by Mohammad Tariquzzaman Mia (Leprosy Control Institute and Hospital, Bangladesh) on the First and Second day of the Conference. 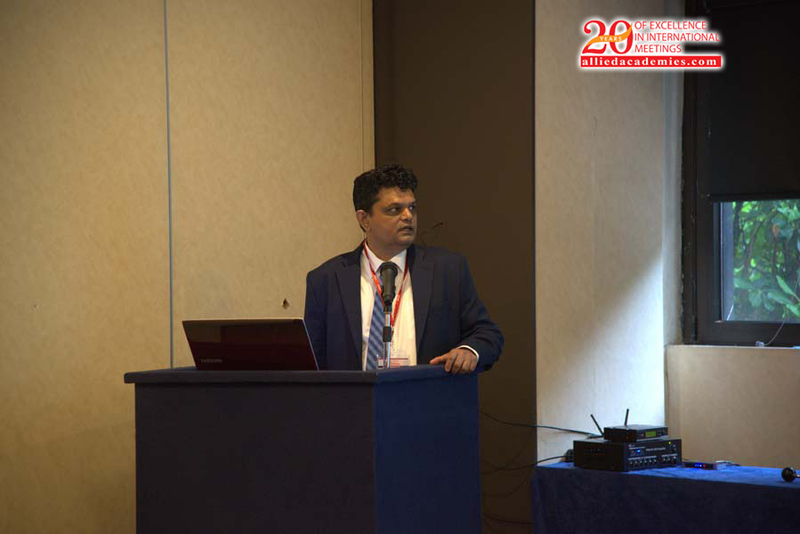 Scientific sessions were chaired by: Palitha Ratnayake, Teaching Hospital-Kandy, Sri Lanka and Huang Wei Ling, Medical Acupuncture and Pain Management Clinic, USA on Day 1 and Day 2. Allied Academies has taken the grand privilege of felicitating World Nephrology 2018 Organizing Committee, Editorial Board Members and Keynote Speakers who supported the success of this event. The esteemed guests, Keynote speakers, well-known researchers, and delegates shared their innovative research and vast experience through their presentations at the podium of World Nephrology 2018. We are glad to inform that all accepted abstracts for the conference have been published in Nephrology and Therapeutics as a special issue. We are also obliged to various delegate experts, company representatives and other eminent personalities who supported the conference by facilitating active discussion forums. We sincerely thank the Organizing Committee Members for their gracious presence, support, and assistance. With the unique and positive feedback from the conference, Allied Academies would like to announce the commencement of the "3rd World Nephrology and Therapeutics Congress" which is being organized during June 24-25, 2019 in Philadelphia, USA. World Nephrology and Therapeutics congress is going to be held in Rome, Italy during September 20-21, 2018. This is designed to bring all the world-class Nephrologists, Professors, scientists and Researchers to talk over approaches for disease remediation in this Nephrology is a global leader in making high excellence conferences, meetings, workshops and symposia in all main arenas of science, technology as well as medicine has been related with national and international associations, firms and high level characters, committed to host world class conferences and events supports broad scope research and peer review at a broad range of professionals around the globe. 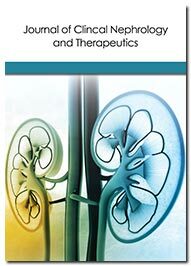 The theme" Embracing novel approaches in field of Nephrology & for better Healthcare” gives us the content to share the novel approaches which is similarly related to Nephrology and their scientific achievements along with latest technological advancements giving us the detailed summary about the conference. The conference invites contestants from universities, clinical research institutions and diagnostic companies to share their research involvements on all aspects of this rapidly growing field and thereby, providing a showcase of the latest techniques. Allied Academies cordially invites participants throughout the world to attend the International Conference on Nephrology on 20-21 September 2018 at Rome, Italy which includes oral talks by eminent speakers, experiences of doctors and scientists, exhibits, poster presentations and sponsors. The aim of organizing the Nephrology and Urology Conference is giving exposure to technologies, government / institutional help, increase international tie-ups and to provide knowledge about research work going on Nephrology. Over years we Allied Academies have been conducting conferences on various issues related to science that we meet in our life. It is a global leader in organizing international conferences, meetings, workshops etc. at higher levels of quality. Being established in 1997 this publishing house has been built on the base of esteemed academic and research institutions including The College of Audiologists and Speech Language Pathologists of Ontario (CAMPOS), The Association for Public Safety Communications Officials of Canada (APCO), The Canadian Vascular Access Association (CVAA), and The Canadian Society of Internal Medicine (C SIM).Lastly, we very much look forward for your contribution and extraordinary dedication. I am honoured to be a part of such a remarkable and talented community. 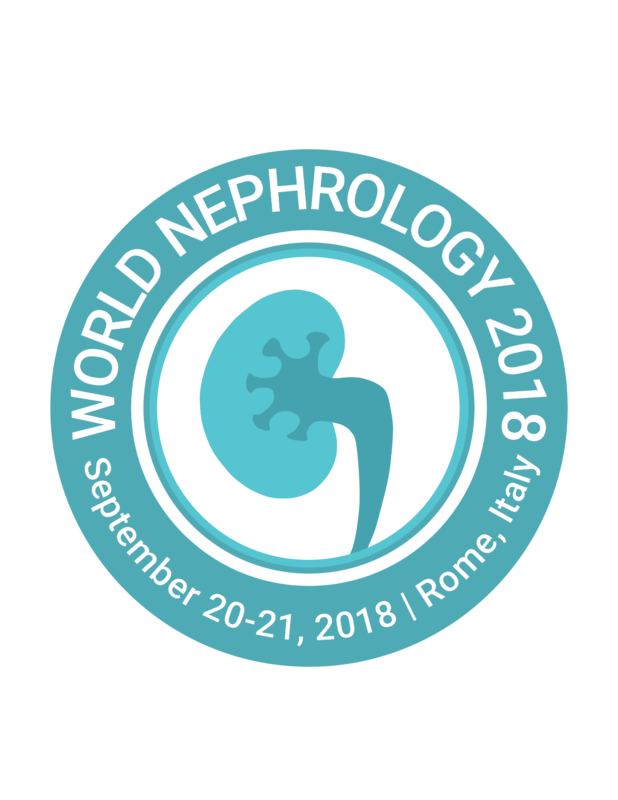 I hope you will join together with us to attend the world Nephrology | September 20-21, 2018 at Rome, Italy. a moment of prayerful reflection before the year begins, and I look forward to the year ahead. Allied Academies cordially invites participants throughout the world to attend the International Conference on Nephrology on 20-21 September 2018 at Rome, Italy which includes oral talks by eminent speakers, experiences of doctors and scientists, exhibits, poster presentations and sponsors. The aim of organizing the Nephrology and Therapeutics Conference is giving exposure to technologies, government / institutional help, increase international tie-ups and to provide knowledge about research work going on Nephrology. Over years we Allied Academies have been conducting conferences on various issues related to science that we meet in our life. It is a global leader in organizing international conferences, meetings, workshops etc. at higher levels of quality. Being established in 1997 this publishing house has been built on the base of esteemed academic and research institutions including The College of Audiologists and Speech Language Pathologists of Ontario (CAMPOS), The Association for Public Safety Communications Officials of Canada (APCO), The Canadian Vascular Access Association (CVAA), and The Canadian Society of Internal Medicine (C SIM).Lastly, we very much look forward for your contribution and extraordinary dedication. I am honoured to be a part of such a remarkable and talented community. I hope you will join together with us to attend the world Nephrology | September 20-21, 2018 at Rome, Italy. a moment of prayerful reflection before the year begins, and I look forward to the year ahead. World Nephrology 2018 conference is the leading event which rotates between continents and is organized in collaboration with regional Nephrology societies with the innovative theme "Embracing novel approaches in field of Nephrology & Therapeutics for better Healthcare". World Nephrology deals with study of kidneys as well as its diseases like normal kidney function, kidney problems, the treatment of kidney stone problems and renal replacement therapy, which are common like haemodialysis and kidney transplantation. Kidney function studies: Increased levels of blood urea nitrogen and keratinise are the hallmarks of acute renal failure. Systemic conditions that affect the kidneys such as diabetes and autoimmune disease and systemic problems that occur as a result of kidney problems such as renal osteodystrophy studied in nephrology. A physician who has undertaken additional training to become an expert in nephrology may call themselves a nephrologists or renal physician. 2nd World Nephrology Conference will discuss the latest technologies and therapeutic aspects developed for various kidney diseases which include renal transplantation, dialysis equipment’s and other procedures involved in treatment of chronically kidney diseases . This unique opportunity to hear the latest discoveries and network with global experts to discuss improving patient care, Renal Data System trends, and key findings at an open forum for providers to share best practices discussions about reducing hospitalizations, improving volume control, increasing the PD patient population, nutritional management and sodium modelling, education. The Organizing committee of Nephrology conference takes the honour of inviting Renowned nephrologists, renal transplantation surgeons, physicians, World- class surgeons, Young researchers, Business delegates and talented student communities working in the field of Nephrology to share their research experiences and indulge in interactive discussions at the event. There are 1,00,000 professional members from more than 126 countries. In addition, with eminent scientists from across 120 countries, Directors & CEO’s, Researchers, Post Docs, Physicians including transplant surgeons, Immunologists, Directors & Brand Manufacturers/ Marketers of Consumer Products. Professors and Students from academia in the field ofNephrology. There are several hospitals offering kidney treatments including dialysis and transplantation. They are well known for health care and fast recovery is promised from the hospital combined with a pleasant and suitable caring atmosphere. According to the global statistics they were nearly 11500 Hospitals in cites associated with kidney treatments and 17000 doctors of Middle East working in the hospitals. Nephrology Societies leads the fight against kidney disease by educating health professionals, sharing new knowledge, advancing research, and advocating the highest quality care for patients. 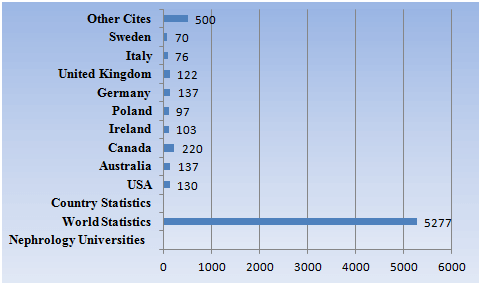 As per the statistics they were 9,000 Nephrology societies across the globe. Profiles of 1600 leading Industries out of 35 production and functional industries were involved with each component of this diagnostic system is designed and developed with utmost engineering using most advanced technology considering the requirements of clinicians engaged in interventional procedures. 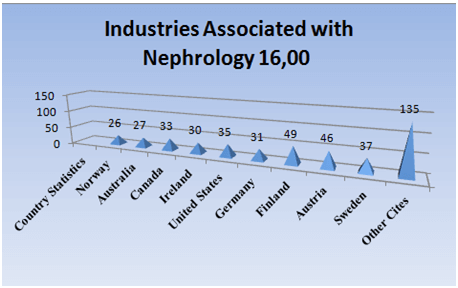 The global nephrology market will grow from nearly $3.8 billion in 2012 to $4 billion in 2013. In 2014 to be worth $6.3 billion for a compound annual growth rate (CAGR) of 2.7%.This year, the global market for products used in the fight against will be worth an estimated $5.5 billion, according to a new technical market research report, the Global Nephrology Market, from USA Research. 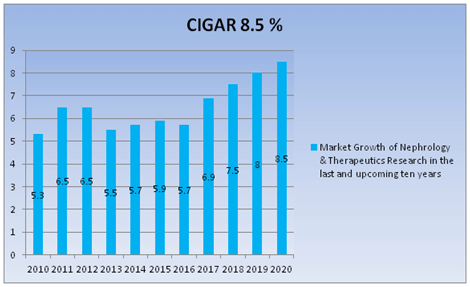 Market revenue is forecast to increase at a five-year compound annual growth rate (CAGR) of 8% from 2013 to 2018, totalling nearly $6 billion in 2018, and it is estimated that on an average 25% of the population throughout the world will be effected with Kidney Diseases by 2025. Nephrology as a discipline, arose from descriptive studies of childhood pyelonephritis. The look of normal kidney feature worries with the kidney issues, treatment of kidney problems. Renal replacement therapy includes Dialysis and Kidney transplantation. The kidneys are a couple of brownish -crimson structures placed retro-peritoneal on the posterior wall of the abdomen from the twelfth thoracic vertebra to the third lumbar vertebra such as renal parenchyma and renal pelvic vicinity Kidneys play a vital role which includes filtration, re-absorption & excretion of metabolic waste products like urea and ammonium, regulating blood stress, electrolyte balance, and RBC production within the body which make an energetic shape of Vitamin D helps in maintaining bone health. Now, Nephrology trends in kidney failure treatment have helped many sufferers. Nephrology includes all the sickness inflicting cancer, cysts, stones, infections and demise of the kidney cells which involves the regular working of the kidneys and also its illness. 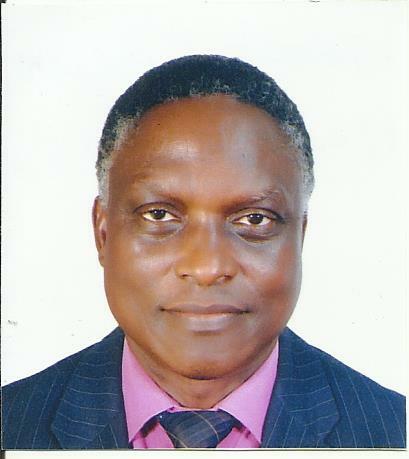 Urology as a discipline arose from descriptive studies of diseases urinary tract and the male reproductive tract. 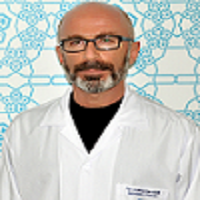 Urology specializes in female urology female urology, male infertility, neurology, urologic oncology, paediatric urology. Urologists are surgeons who have specialized training and experience in the diagnosis and treatment of disorders of the urinary system in men and women, including the kidneys, as well as disorders of the male and female reproductive system. Urologists have the surgical skills necessary to treat conditions ranging from kidney stones to kidney, bladder, testicular and prostate cancers as well as urinary incontinence, pelvic health conditions, and male reproductive issues such as erectile dysfunction. Paediatric Nephrology specialized diagnosis and treatment of kidney diseases, including electrolyte disturbances and hypertension, including dialysis and renal transplant patients. Many diseases affecting the kidney are systemic disorders not limited to the organ itself, and may require special treatment. Examples include acquired conditions such as systemic vasculatures and autoimmune diseases as well as congenital or genetic conditions. High blood pressure is a leading cause of kidney disease and kidney failure. Hypertensive kidney disease is a medical condition referring to impairment to the kidney due to chronic high blood pressure. Benign Nephrosclerosis is common in individuals over the age of 60 where malignant Nephrosclerosis is uncommon and affects 1-5% of individuals with high blood pressure, that have diastolic blood pressure passing 130 mm Hg. It should be illustrious from Reno vascular hypertension. Diabetic Nephropathy means a kidney sickness or harm. Diabetic nephropathy is a chronic situation characterized by means of high blood pressure, progressively increasing urinary albumin excretion, presence of Diabetic retinopathy, declining GFR .In excessive cases it could result in kidney failure. Many tiny blood vessels in the kidney clear out the waste out of your blood and high blood pressure wreck these blood vessels. Over time, the kidney is not capable of do its process as expected. Later it could forestall running absolutely which is known as Kidney failure. Up to 40 present of human beings with diabetes sooner or later increase kidney ailment. Nephritis is inflammatory kidney disorder. Nephritis is non-inflammatory kidney sickness. IgA nephropathy additionally called Berger's disease is a kidney sickness that happens whilst an antibody called immunoglobulin A (IgA) lodges to your kidneys which results in infection through the years which abate your kidneys potential to filter waste from your blood. The major remedy is to lower blood pressure which helps in preventing the harm for the kidneys. Angiotensin-changing enzyme inhibitors, Angiotensin II receptor blockers are the drugs. To put off, diabetic nephropathy wholesome life style must be carried out by treating diabetes and high blood pressure. Acute renal failure is an abrupt decline inside the glomerular and Tubular function ensuing within the failure of the kidneys to excrete nitrogenous waste and hold Electrolyte Homeostasis. Metabolic acidosis involves in the cause of number of complications along with excessive potassium stages, uraemia, and modifications in body fluid stability and results on different organ structures, including loss of life. Persistent kidney disorder occurs in the result of AKI. Management includes remedy of the underlying reason and supportive care, such as Renal alternative remedy. The causes include perennial, intrinsic,post renal reasons. Cardiovascular collapse is to prevent initial stage of predominant targets and demise and to call for specialist advice from a nephrologist. Control of AKI mechanically includes the avoidance of substances which might be poisonous to the kidneys, referred to as Nephro toxins. Hydronephrosis is a structural situation that commonly takes place. Kidney swells because of the failure of regular drainage of urine from kidney to the bladder which results in distension and dilation of the renal pelvis and calyces which has an effect on any age and is once in a while spotted in unborn toddlers at some stage in ordinary pregnancy ultrasound scans, where no motive is detected it is called Idiopathic hydronephrosis. And with a definable reason and is called Secondary hydronephrosis. Hydronephrosis may additionally or won't cause signs. The most important symptom is flank ache, stomach or groin, Symptoms depend on the motive and severity of urinary blockage hazard elements like kidney stones, urinary tract infections might also lead to hydronephrosis. To diagnose the disease, ultrasound is used. Treatment includes hydronephrosis which blocked the glide of urine and treatment choice depends on the disorder. The kidney disorder (Nephritic) reasons your body to excrete an excessive amount of protein for your urine. This is mainly due to harm to the clusters of the small blood vessels on your kidneys that filter waste and extra water out of your blood. This disorder is typically seen in youngsters and is characterized by way of huge proteinuria, Hyperlipidaemia, and oedema which evolves in the face. Lapidarian also can occur, but isn't always crucial for the prognosis of nephritic syndrome. Hypernatremia also happens with a low fractional sodium excretion. The syndrome can occur in any kidney disorder that damages the filtering gadgets. Nephritic syndrome, along with nephritis, have an effect on simplest the kidney carrying the illnesses. Diseases that affect only the kidneys are referred to as number one reasons of nephritic syndrome. The headaches on advisement of the situation include Hypothyroidism, anaemia, high blood pressure, Coronary artery sickness. Urine samples are taken to understand the underlying cause of the disease and the remedy commonly involves medication and diet. Renal cell cancer is a disease in which malignant cells form in proximal convoluted tubules of the Kidney. The most common type of kidney cancer in adults is Renal cell carcinoma also named as Hypernephroma, Renal adenocarcinoma or Granit’s occurs most often in men 50 to 70 years old. Blacks are at higher risk than whites. Smoking and misuse of certain pain medicines can affect the risk of renal cell cancer. The principal treatment options may include surgery, molecular-targeted therapy, and immunotherapy. The recommended treatment for Renal cell cancer may be partial Nephrectomy, surgical removal of all or part of the kidney. The incidence of RCC varies between sexes, ages, races and geographic location around the world as men have the higher incidence than women which has been increasing in frequency worldwide for about approximately 2-3% /decade until the last few years where the number of new cases has stabilised. Chronic kidney sickness which is a completely not unusual medical problem in aged patients which is related to multiplied morbidity and mortality. As life is enhancing worldwide to maintain growing prevalence of comorbidities and risk factors including Hypertension and Diabetes within the population as 1 to 10 human beings have some diploma of CKD. They have about 25,000-30,000 genes. The envisioned glomerular filtration price (egger) can be used as a analysis test for the ailment. Some diseases inside the kidneys are as a result of issues in genes. Autosomal Dominant Inheritance resulting with a illnesses from a mutation in just one of the two copies of a gene. Polycystic kidney ailment is a maximum commonplace genetic disease that impacts the Kidneys and other organs. Clusters of fluid-crammed sacs, referred to as cysts, increase in the kidneys and interfere with their potential to filter out waste products from the blood. Genetic checks or DNA evaluation are used to check the presence and severity of the disorder. Urology is a branch of medication that focusses on surgical and medical sicknesses of the urinary tract system which is referred as Genitourinary surgical procedure and an infection in any part of the Urinary device referred as Urinary tract infection. When it affects the decrease urinary tract it is called a Bladder contamination. It impacts upper urinary tracts referred as Pyelonephritis. Urology includes Kidneys, Adrenal glands, Ureters, urinary bladder, Urethra, and the male reproductive organs. Common illnesses consist of Benign prostatic hyperplasia, Urinary incontinence, UTI, Urethral stones and many others. Phenazopyridine is on occasion prescribed in the course of the primary few days similarly to antibiotics to help with the burning and urgency every so often felt throughout a Bladder infection. Women with terrible cultures improve with antibiotic remedy as signs can be indistinct and without dependable checks for urinary tract infections. Nephrotoxins are substances displaying Nephrotoxicity that inhibits damages or destroys the cells and/or tissues of the kidneys. Recent clinical studies have shown that between 30% and 60% of drug toxicity have kidney disorders, acute Glomerulonephritis, and a Cute interstitial nephritis. Nephrotoxicity is a typical of disorder involves the interaction of environmental factors and genetic factors to increase the susceptibility of an individual causing kidney failure. The Kidney Transplantation is life extending surgical procedure to treat End-stage renal disease. When function declines to a certain level, patients have End-stage renal disease as it requires dialysis or transplantation to sustain life and they stop functioning normally when the kidneys have lost about 90% of their ability. Incompatible transplantations HLA and ABO conduct end-stage kidney disease. Anti-rejection medications, also known as Immunosuppressive agents are necessary for the "lifetime" of the transplant. Rejections may occur if medications are stopped and Kidney transplant will fail. Cardiac and pulmonary insufficiency, Hepatic disease, and some cancers are included in contra indicators. Pancreas transplant is done in patients with diabetes mellitus type 1 where the diabetes is due to the destruction of beta cells and also due to Renal failure. Drugs in this vary according to the drug therapy taken. These recipients are not encouraged in consuming grapefruit, pomegranate and green tea products as these products are known to interact with the transplant medications, Tacrolimus, cyclosporine, sirolimus and the blood levels of these drugs may be increased which leads to an overdose. "Fluids and Electrolytes Demystified," involves progressive and irreversible loss of Kidney function. excretions preserved at near-normal levels in patients with CKD as long as both the Renin-angiotensin-aldosterone system (RAAS) and distal Nephron flow are maintained. Deficits of water or electrolytes can be compensated for by increases in intake and retention, whereas excesses are compensated for by increases in Urinary excretion. Advances in Nephrology, Dialysis and Transplantation is multidimensional assessment tool for uremic pruritus in dialysis patient. Kidney deterioration as patients with congenital Urinary tract disorders, even after they have been repaired is incumbent on those caring for these patients as they age. Thoughtful evaluation of those patients in whom kidney compromise may be aggravated by drainage and storage disorder will optimize native renal function. Management targeting an individualized systolic blood pressure (SBP) is associated with reduced risk of organ dysfunction among patients undergoing major surgery who are at increased risk of postoperative complications. Haemodialysis is noted for purifying the blood of a person whose Kidneys are not running commonly. replacement remedy gives the choice for patient who need dialysis acutely and for many patients as preservation therapy. It can be an outpatient or inpatient remedy. Haemodialysis frequently entails fluid elimination and the side outcomes because of this method include low blood stress, fatigue, chest pains and many others. Neuropathy results in long term headache and numerous kinds of coronary heart disease. Counter modern waft, utilizes Haemodialysis where the dialysate is flowing within the contrary direction to blood go with the flow in the extracorporeal circuit. Counter-modern flow continues the attention gradient throughout the membrane at a maximum and will increase the performance of the dialysis. The machines available in the market display an array of various protection-crucial parameters which also includes blood and dialysate drift prices. dialysis answer conductivity, temperature, and PH and analysis of the dialysate for evidence of blood leakage or presence of air. The drugs which are supplemented included vitamins, calcium, iron, phosphate, binders, Antipruritic. Renal vitamins is involved that kidney sufferers the proper ingredients to make Dialysis efficient and enhance health. Dietary adjustments can also help manage high blood pressure, Oedema, and Hyperlipidaemia, and slow the progression of renal disorder. Kidney sickness which includes the control of top blood glucose or put off diabetic headaches. High-protein diets are not advocated as they will encourage harm to the nephrons, main to a development of Renal insufficiency. Good blood glucose helps you put off diabetes headaches such as kidney disorder. Dietician can suggest the picking of foods for the proper function of the kidneys which includes potassium, protein, phosphorus, sodium etc. Diet, being lively, retaining a healthy weight, and drugs can all help you stay wholesome with no sicknesses. Nephrology nursing which includes stopping disease assess the health needs of patients and families. Nursing Care spans the lifestyles cycle and includes sufferers who're experiencing the real or threatened effect of acute or continual Kidney disorder. Patients are now restricted to Cardiovascular ailment, Hypertension, infectious disease, bone disorder Psychiatric situations where the care is seen complicated. Apart from these, many face psychosocial problems. Now, the nurse’s role would be to help patients manipulate their lives be triumphant at school or paintings, socialize, hold relationships, or enjoy pastimes - while efficiently handling their fitness problems. The motive of nursing is to emphasis the most outrageous notion of the discriminatingly debilitated or insecure limitless kidney sufferers. The aim of Care Nursing’s is to present professional’s accurate, present day, and fabric records and cabin to surpass desires in separating concept exercise. There is a growing awareness today about Health and Fitness among the masses, large sections of health conscious people have started reviewing and questioning the modern lifestyle. Most healthcare specialists today believe that most of the diseases from which the mankind is afflicted are the outcome of their wrong living habits and increased pollution in the environment. that is why a system like Yoga and Naturopathy is gaining more acceptance across the globe. Nature cure is an art as well as a science of healthy living and a drugless system of healing diseases.it has its own concept of disease and principles of treatment. In today’s world, the awareness created for Health and fitness among the people have been conscious and started reviewing and questioning the modern lifestyle. As many believe that most of the diseases is due to their kind of living and along with increased pollution in the environment. For all these, Yoga and Naturopathy is gaining more conscious and tricking among the people all over the globe. Nature cure is an art as well as a science of healthy living and a drugless system of healing diseases.it has its own concept of disease and principles of treatment. Nephrological treatment include Steroid medications, blood products, dialysis and plasma exchange. Kidney Problems can have significant impact on quality and length of life, and so Psychological support, health education and advanced care planning play key roles in Nephrology. All fully paid registrations are transferable to other persons from the same organization, if registered person is unable to attend the event. 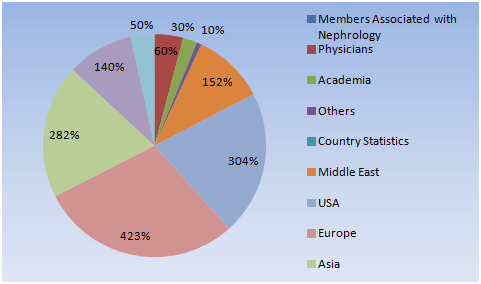 Transfers must be made by the registered person in writing to is worldnephrology@alliedmeetings.com . Details must include the full name of replacement person, their title, contact phone number and email address. All other registration details will be assigned to the new person unless otherwise specified.